The 2018 Wheatland Middle School football season came to an end on Thursday, October 11th with the cancellation of the game in Rawlins. 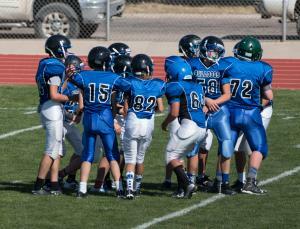 The 8th grade team finished their season with a record of 4-3. The Wheatland team had quality wins over Lusk, Saratoga, Burns, and Glenrock. 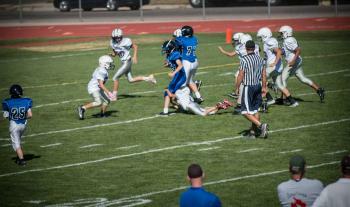 The 7th grade team finished their season with a record of 3-3. The Wheatland team had quality wins over Burns, Glenrock, and Lusk. 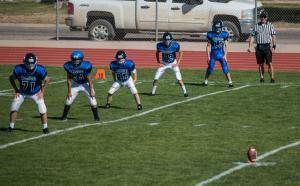 Two Chugwater 7th graders were members of the team. Luke Redding (15) played Running back and Safety. 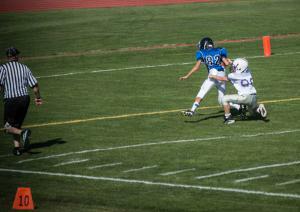 Megan Sagner (82) played Tight end and Defensive end. Both players scored multiple touchdowns this season while on offense. 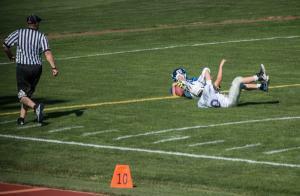 On defense, Luke had a touchdown saving interception against Torrington, while Megan had several hard hits and caused a fumble in the same game. Both players were key members of the team.